Earth's desert winds create characteristic ripples and dunes. By measuring and modeling these landforms, researchers can use their shapes to learn more about wind processes. With Earth as a jumping-off point, planetary geologists are now looking at Mars' dunes and ripples from afar  and finding that they are generally larger than those on Earth. Studies of the landforms may provide clues to Mars' winds, past and present. Ripples in a crater on Mars, taken by the Mars Orbiter Camera (MOC) on the Mars Global Surveyor. Image to the right is the detail in the white rectangle. The width of the image to the right is about 3 kilometers, and height, about 52 kilometers. Images courtesy of NASA. Ripples form differently than dunes, occurring at regular intervals and built by surface creep, where the wind pushes particles along. Dunes form in a higher energy process called saltation, where high winds carry small particles up gentle slopes and then drop them on steeper dune lee-sides, to fall into an angle of repose. The process tends to sort particles by size when it deposits them. Particle sizes in ripples tend to be more mixed than in dunes, and large ripples on Earth tend to be made of large pebbles. Using the highest resolution images available, Kevin Williams of the Smithsonian Institution's National Air and Space Museum presented measurements from dunes and ripples on Mars at last week's Geological Society of America meeting, held in Seattle. 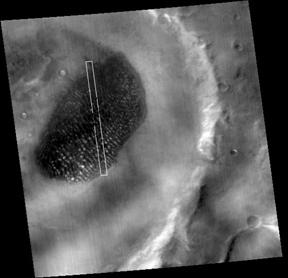 Williams began by searching for evidence of dune migration on Mars, comparing remote-sensing images from the Viking spacecraft, taken in the 1970s, to more recent and higher-resolution images from a camera known as the Mars Orbiter Camera, or MOC, on the Mars Global Surveyor. Because the resolution from Viking's photos was not fine enough, Williams instead looked more carefully at stereo images from MOC, creating height profiles of some surprisingly large landforms. The ripples Williams measured on Mars were up to 5 meters tall  about twice as large as any wind-created ripples on Earth, the largest of which get to be about 2 meters (for example, in California's Mojave Desert). They also had different wavelength-to-height ratios. And, Williams says, "the large dunes we are looking at are taller than we'd expect them to be on Earth for their height and distribution." The difference from Earth is partly attributable to the difference in the two planets' atmospheres. Because Mars' atmosphere is one hundredth the density of Earth's, says Williams, "you need stronger winds to move the same particles." The difference in gravity between the planets also affects dune- and ripple-building processes. The age of the dunes and ripples  and whether they are still active  might provide clues as to whether Mars' atmosphere was once thicker or whether its winds were stronger in the past. "I think what Kevin is doing is very exciting," says Herb Frey, a Mars researcher and geodynamicist at NASA Goddard Space Flight Center. Williams' precise work, he says, is a small step in "trying to quantify the full range of conditions in which things might form." Upcoming missions to Mars might help to answer questions regarding sizes of the particles that compose the dunes and ripples, which should be wrapped into wind models as well, Frey says. Another uncertainty lies in the particles' composition, says Greg Wilson of the Jet Propulsion Lab in Pasadena, Calif. Sand on Earth is typically quartz, but on Mars, the particles should be made of weathered basalt, which is not as strong. "There's a question as to whether they would act as sand grains," Wilson says, or whether the basalt grains would break down rapidly as higher winds push them along. "As far as I know, no one has actually looked at this parameter  wavelength-to-height ratio  for these types of aeolian bedforms on Mars," says Nathan Bridges, also of the Jet Propulsion Lab. The ripples Williams and others are studying are a special class of aoelian bedforms, he says, for which "the extent and commonality on Mars have only come to light with MOC  this is really kind of new territory." Tiny particles of dust carried in Earth's atmosphere have broad effects on both climate and soil. Recently, Natalie Mahowald of the National Center for Atmospheric Research (NCAR) in Boulder, Colo., and her co-workers modeled the future of dust on Earth, showing that the mass of atmospherically transported dust could decrease substantially over the next 100 years. At last week's joint meeting of the American Society of Agronomy, the Crop Science Society of America and the Soil Science Society of America, the scientists took those results one step further, to show how important that shift will be to major ecosystems across the planet. Mahowald and Chao Luo of NCAR found that human disturbances may have already decreased the amount of dust carried in the atmosphere by about one quarter in pre-industrial times. On the whole, their future scenarios indicate dust may decrease even more by 20 to 60 percent within a century. These results, however, depend on assumptions about land use and human-induced climate change. Different assumptions lead to the results that a century or so ago, humans were responsible for loading the atmosphere with about 60 percent more dust. Mahowald presented six scenarios of past and future dust transport, which were first published in the Sept. 10 issue of the Journal of Geophysical Research Letters. The projected reduction in dust could result in changing temperatures for the planet, as the tiny particles absorb heat from the sun when they are suspended in the atmosphere. The loss could also limit productivity of the oceans because of reduced delivery of iron by airborne dust. But such a change could also be bad news for ecosystems that rely on dust to deliver phosphorus, says Greg Okin, a soil geologist at the University of Virginia in Charlottesville, who presented with Mahowald at the meeting in Denver, Colo., last week. Looking at modern scenarios only, Okin and his co-workers put two pieces of the phosphorus source puzzle together: first, by assuming that airborne dust carries a certain amount of phosphorus, and second, by looking at how much phosphorus is deposited in different soil types around the world, as recorded in the scientific literature. Taken together, they could determine how much time it might take for dust to replace phosphorus in an ecosystem where plants continually draw down the resource. In North America, Okin's team determined that dust is not as important, because plants take a few million years to go through the phosphorus contained in the young soils there. However, he says, "dust ends up being important in the southeastern United States, which has old soils and a lot of water," dissipating phosphorus there. At the other end of the spectrum, the Amazon takes only a few thousand years to cycle through its phosphorus resources, despite the fact that plants there have evolved to use the element efficiently. "Productivity in the Amazon forest is maintained by a linkage with African dust sources," Okin says. No dust from Africa means no added phosphorus. These conclusions depend on information about plant cover, soil types and geomorphology, Okin notes, but he says that their current work will improve future model inputs. The research team's results are currently in revision for publication in Global Biogeochemical Cycles. "This is a new piece," Okin says, of the mineralogical dust puzzle. "The ocean has been talked about for a long time, but dust on land may be just as important." Alessandra Giannini of the International Research Institute for Climate Prediction in Palisades, N.Y., calls Mahowald and Luo's model scenarios "interesting sensitivity experiments, in that they bring in vegetation components," something most climate models ignore because of complexity. "They can show the uncertainty is high," she says. Ted Zobeck, a soil and wind erosion scientist at the U.S. Department of Agriculture research station in Lubbock, Texas, said Okin's work points to new areas for study, where there are gaps in knowledge on a global scale. "It's an interesting way to look at the cycling of phosphorus in ecosystems," he says, and he would like to see more detail on how grasslands, tundra, forest and other systems respond to dust inputs and initial soil conditions.